SAN FRANCISCO (AP) — Four straight days of rain have replenished several key reservoirs in drought-stricken California, but the El Nino-related storms also led to the death of a highway patrol officer who was struck while directing traffic on a snowy Sierra Nevada freeway. The series of storms that started late last week was expected to taper off Monday, with warm temperatures and blue skies forecast throughout California this week. The latest storm weakened as it moved south, bringing drizzle and a high surf advisory to Los Angeles County. In Northern California, authorities reported that lakes Shasta and Oroville haven't been this full since 2013, delighting a state in its fifth year of drought but falling short of ending concerns about the drought. 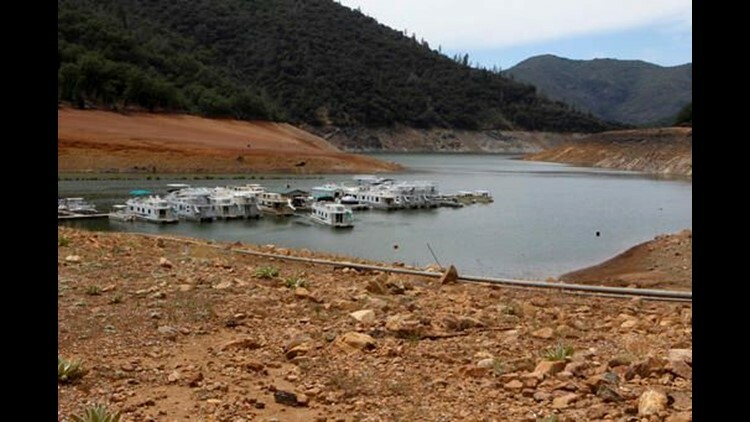 Lake Shasta, the state's largest reservoir, was at 79 percent capacity on Monday and at 103 percent of its historical average for this time of year. The 21-mile long reservoir north of Redding now holds 3.6 million acre-feet of water, enough to supply 3 million to 6 million households for a year. The federal reservoir is critical to farms and cities throughout the agriculture-rich Central Valley. "It's definitely welcome news, but it's kind of a mixed bag for us," said Shane Hunt, a spokesman for the U.S. Bureau of Reclamation. "We still don't have water in all the right places to meet demand going into peak season." For example, man-made Lake Melones in the Sierra Nevada foothills remains at just 22 percent of capacity and well below the historical average. The state's second largest reservoir, Lake Oroville, was at 70 percent of capacity and 97 percent of its historical average. Folsom Lake, 25 miles northeast of Sacramento, was at 69 percent of capacity. Heavy snow fell throughout the weekend in the Sierra Nevada, and up to 3 feet was expected in the higher elevations through Monday. That snowpack normally stores about 30 percent of California's water supply. California Highway Patrol officer Nathan Taylor died late Sunday after being struck Saturday by an out-of-control Nissan Pathfinder on Interstate 80 near Truckee, California. The 35-year-old officer had been directing traffic around an accident when he was hit and knocked several feet into the air. The weather was so bad that the officer had to be taken to a Reno, Nevada, hospital by ambulance instead of helicopter. Taylor died after undergoing surgery. The CHP said Taylor was married and had three young sons. "''It is an incredibly sad day for Officer Taylor's family, the CHP, and the state of California," CHP Commissioner Joe Farrow said in a written statement. "The loss of an officer protecting our community is truly devastating." Two people in Northern California died earlier this month in previous storms. One woman drowned after the car she was riding in drove into floodwaters in the Sacramento area. Another person was killed in the San Francisco Bay Area when a car jumped a roadway and hit trees.